The story of David and Goliath is the tale of how a young boy manages to defeat a brutal, experienced, and huge warrior. Over the centuries the story has come to symbolize how ordinary people can accomplish great things, defeat great obstacles and change the course of history. The story is often a bit misunderstood, since it is told as a story of luck. However. David's victory over Goliath had nothing to do with luck. It was a totally logical outcome of having the right training, the right tools, and the knowledge of how to use them to defeat Goliath. While Goliath had huge armour, David had none. This made him fast and nimble. He knew how to use his slingshot and how to make sure it had exactly enough impact to take down the great giant. Who is then our modern day Goliath? Goliath is seldom a who and more often a what! In everyday life we often meet Goliath. For Hanna and Goliath Law & Education, Goliath are all the different obstacles and structures that stand in the way for a society or an organisation to reach its full potential. 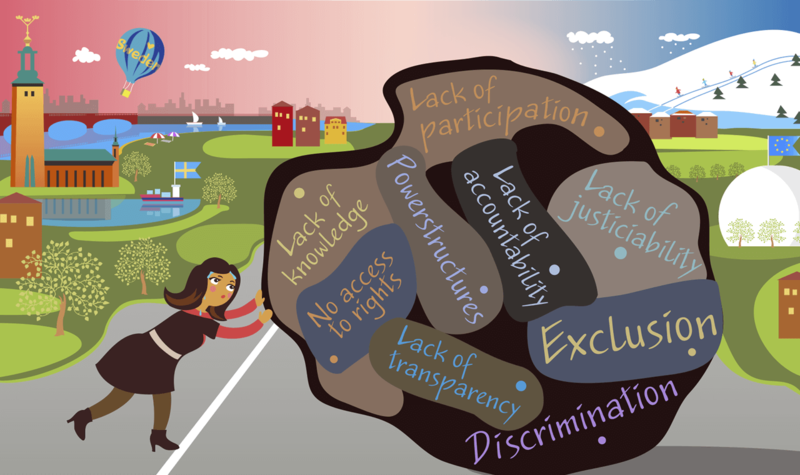 Goliath is a metaphor for discrimination, exclusion, the lack of participation, lack of accountability, lack of justice, and the lack of knowledge and access to your rights. To be able to challenge Goliath you need both the right tools and knowledge of how to use them. The vision of HannaAndGoliath Law & Education is to be able to help you on that journey.